I caught the guitar bug when I was 13 years old. These were the years of the British Invasion. I owned an old Stratocaster (which I wish I still had), so I was very keen on Fender instruments. At the time practically all Fender guitars came with a bridge cover. Many players thought this was a cool feature and kept it on the instrument. The bridge cover in fact served a purpose. It helped in shielding the pickup from electrical interference, as well as providing a palm rest for the player. In my naivete, I thought the Telecaster only had one pickup, since the metal bridge cover was in place. I was totally amazed when I saw the album cover of a long forgotten British group, in which the guitarist was holding a Telecaster-shaped instrument with no visible pickups! It was not long after this one of my friends purchased a Telecaster and I discovered the hidden neck pickup. Shortly after that I received a 1965 Fender catalogue with pictures of the Fender Esquire. 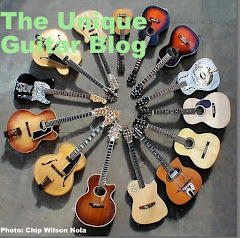 The Esquire has the distinction of being the first guitar sold by Fender. It was introduced in 1950. Remember, at the time, Fender’s market was steel guitars. 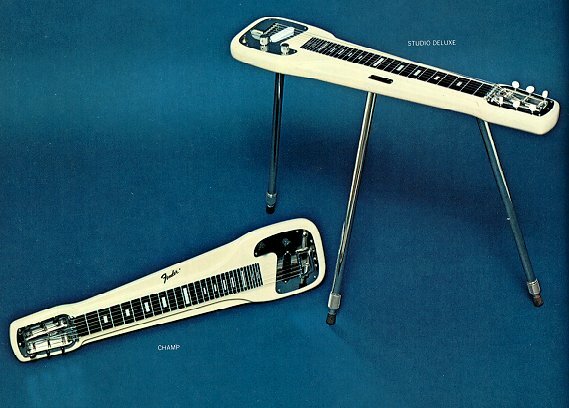 So the Esquire utilized a similar set up to that of a steel instrument, which had only one pickup placed near the bridge and a tone and volume control. We have all seen pictures of Leo’s prototype guitar, which he created in 1949. 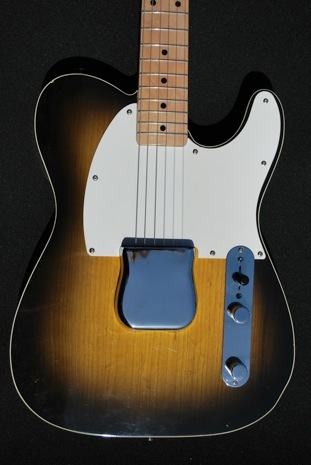 The bodies shape was similar to the slab style of the Esquire/Telecaster, with its single cutaway, which allowed the player access to the upper frets. The neck was dissimilar in that it had a 3 on a side headstock. Like the models to come, it was attached to the body by four wood screws. The maple neck on the prototype and on 1950 Esquires did not have a truss rod. Nor did it have a fretboard. The frets were attached directly to the top side of the maple neck. The neck was wider on the prototype than on the production model. The bridge had the same 3 saddles that are still featured on vintage models. The single pickup was slanted to enhance the bass and treble strings. The pickup was not covered and featured six pole pieces. 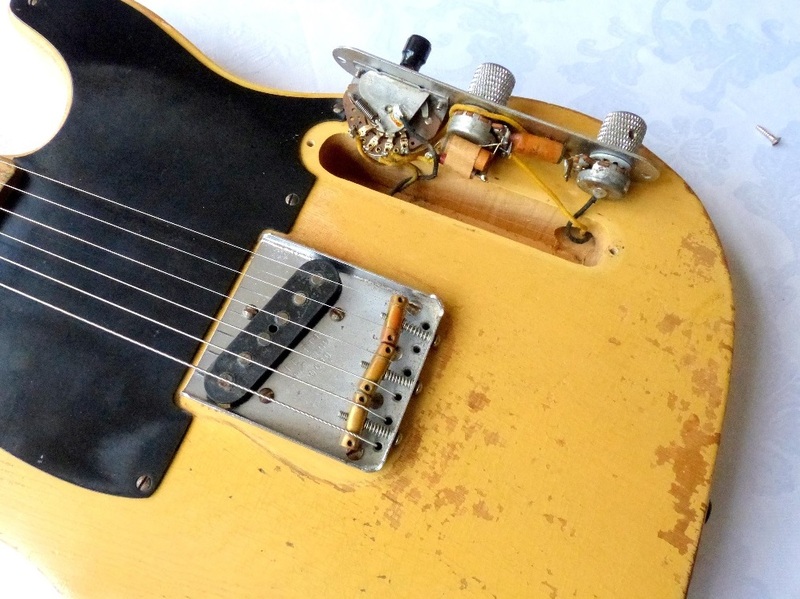 The prototype lacked a selector switch and the wiring pattern of the Esquire. It was mounted at an angle. The pick guard only covered the bottom portion of the guitars. The prototypes body was made of pine. 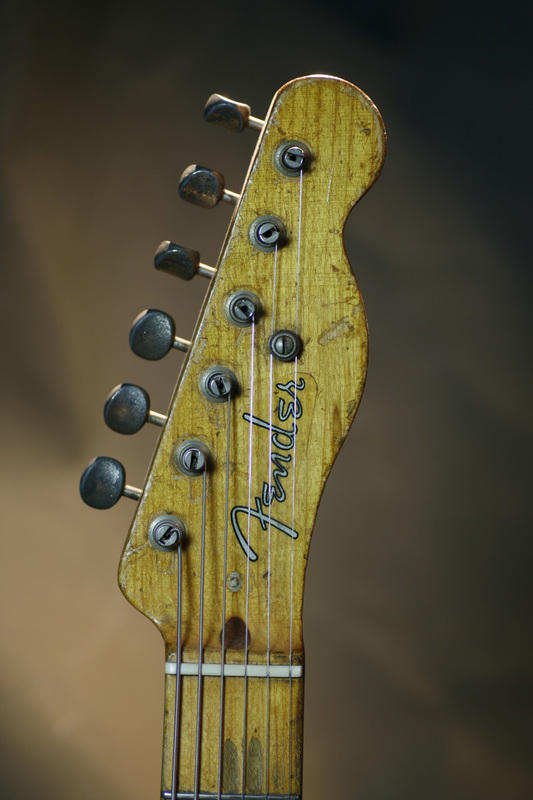 Leo Fender redesigned the guitar to include the trademark six-on-a-side headstock. He reshaped the neck so it was narrower at the nut. He also ran the strings through the body to rivets on the back that served as string stops. This gave the guitar more resonance. 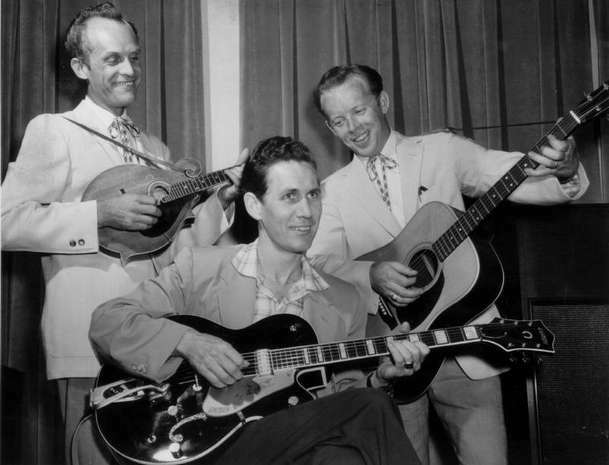 Country bands usually consisted of an acoustic player and a steel player, a drummer, a fiddler, an electric guitar player, maybe a banjo player and possibly a string bass player. Leo’s concern was about the electric player. How could he add some versatility to the guitars sound? What if there was no bass player? Could the electric player cover the bass lines? To solve this, he added a unique three position tone circuit. The third position was the pickup wired directly to the 250k volume potentiometer, but not the tone control. This gave the guitar an added boost and a bright sound. Eddie Van Halen did the same thing to give his home-made guitar a hotter sound. The middle position was the pickup wired to the volume and 250 tone potentiometer with a .05uF capacitor running between the tone and volume pots to ground. The first position included a .05uF capacitor wired to a 3.3k resistor which was wired to yet another .05uF capacitor that is wired to ground. This position yielded a fixed bass tone. Fender thought this would allow the guitarist to cover bass lines. The original Esquire was slightly shallower than the prototype and had a solid ash body. The body had a butterscotch colour and the scratch plate was solid black. The control plate was mounted parallel to the bridge plate. 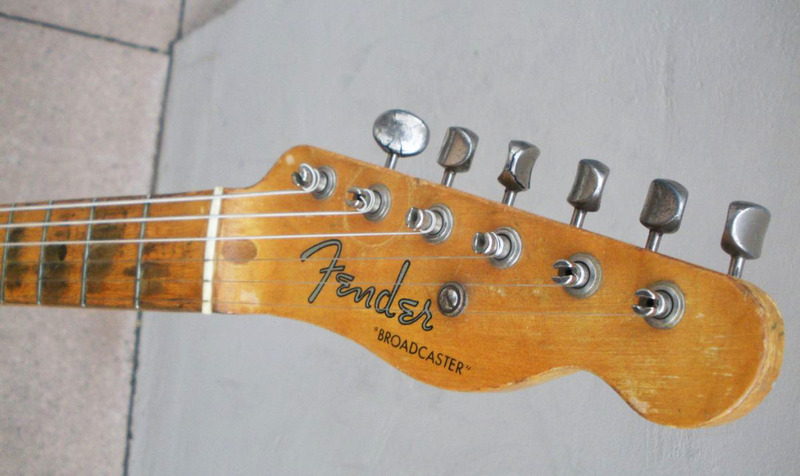 The next logical step was a two pickup Esquire, which Fender called a Broadcaster. Unfortunately, the Gretsch Company manufactured a drum set called The Broadcaster and requested that Fender not use the name. "Telecaster" guitars from this period did not have a model name on the headstock. These have come to be known as Nocasters. Fender briefly discontinued promoting The Esquire during this period. However it was reintroduced in 1951 and this time it came with a truss rod. 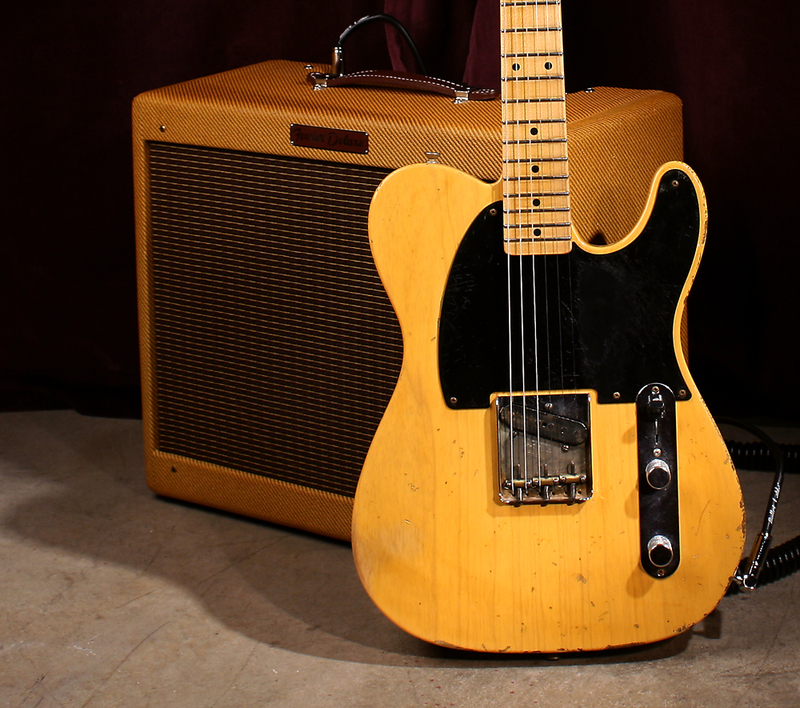 The Esquire and The Telecaster now utilized the same bodies. Both were routed out for two pickups. 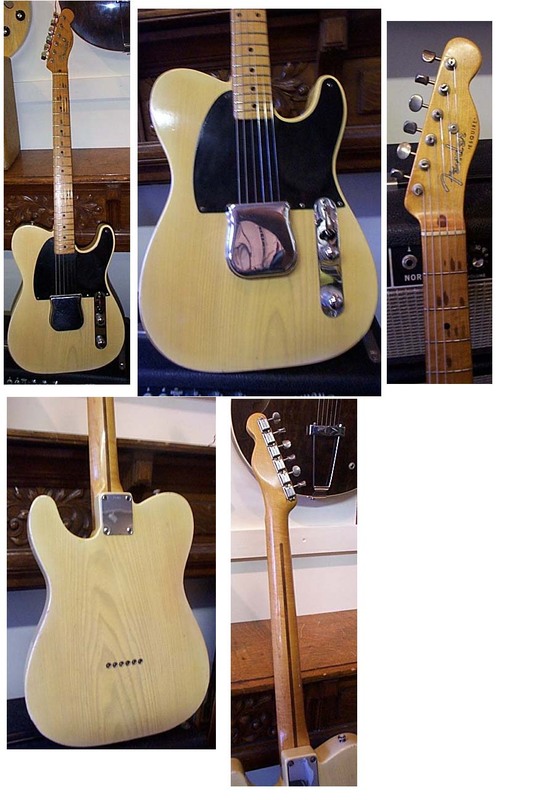 The Esquire with its one pickup sold for a slightly lower price. A guitarist could easily convert an Esquire to a Telecaster with the purchase of an additional pickup and a Telecaster scratch plate. Many guitars modified their Esquires. The Esquire remained in the Fender line up until 1969, when it was discontinued due to lack of sales. 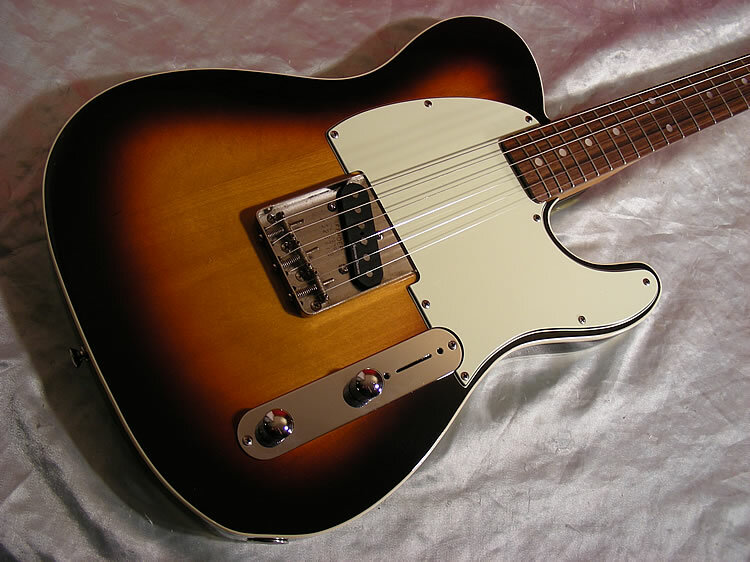 During the transition years of the mid 1980’s, when Fender guitars were all produced in Japan, a Japanese Fender Esquire model was produced based on the 1954 specs. Several years ago, Fender offered a Squier Avril Lavigne model, with only one bridge pickup. I suppose this could be construed as an Esquire. The Esquire is once again being offered in Fenders current line up. I played the new model last week and guarantee it is a beaut!